There’s a lot on my mind today and it’s keeping my thoughts rather occupied. 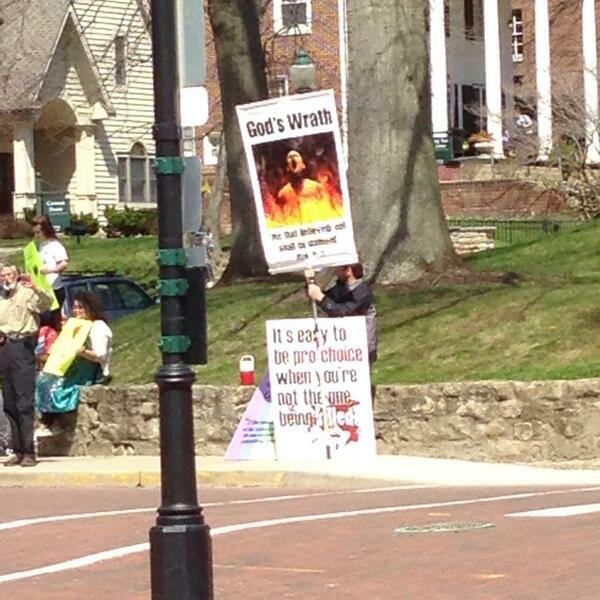 There is a demonstration going on near college green at the moment about God’s wrath and abortion. And, it’s causing a pain that’s going straight to my soul. We live in such a broken world, where justice has been perverted and people think that by ostracizing their neighbors they are loving them. There seems to be this unspoken idea that having any compassion towards the sinful is the same thing as accepting their sins, and therefore to prevent that we must constantly show our hatred towards those sinners. And, this idea extends much further than college green. There is a constant screaming going on for the rest of our country to submit to a course of “behavior modification”. We hate our liberal neighbors, disown the woman in our churches for having an abortion, never tip at restaurants, tell gays they can’t enter our churches, yell at our coworkers for the littlest things, and yet we still try to maintain our perfect images by sitting in the first pew every Sunday. In fact, the lifestyle of the average American Christian fits into the description of the Pharisees in Matthew 23. Brothers and sisters, we were never called to live this way. And, what Jesus would say to us is the same thing He said to the Pharisees..
25 You Pharisees and teachers are show-offs, and you’re in for trouble! You wash the outside of your cups and dishes, while inside there is nothing but greed and selfishness. 26 You blind Pharisee! First clean the inside of a cup, and then the outside will also be clean. 27 You Pharisees and teachers are in for trouble! You’re nothing but show-offs. You’re like tombs that have been whitewashed. [c] On the outside they are beautiful, but inside they are full of bones and filth. 28 That’s what you are like. Outside you look good, but inside you are evil and only pretend to be good. Certainly we didn’t learn this from Christ. Christ never disassociated Himself with the “sinners”, yet instead He ate with tax-collectors. Now the tax collectors and sinners were all drawing near to hear him. And the Pharisees and the scribes grumbled, saying, “This man receives sinners and eats with them. Christ never waited for us to “clean up” before he could love us. In fact, while we were still sinners, Christ died for us (Romans 5:8). When we hated Him in our hearts and stood as enemies to God, He took on our pain. Every time that whip hit His back, He had You on His mind.And what was there left for Jesus to say about us? Did He ask God to send us to Hell for our sins? No. He didn’t. He continued to love us, despite the fact we were messy and dirty and impure and adulterous and slanderers and so different from His perfect being. Through Jesus’ death and resurrection, sin was conquered for all. All that is left is to choose to live in this forgiveness. If you haven’t done this before, I encourage you to do so. All it takes is a conversation from you to God, recognizing your sin and failure, believing that through Jesus’ death that sin has been atoned for, and choosing to live for Him. If you have made this choice, it is time to start living from an eternal perspective! We are no longer slaves to law, but living in GRACE! We have been throwing stones that were never ours to throw. Empty your hands, and allow God to have His rightful place of Judgement. We are called to love others, not throw the first stone at them. When we view people from an eternal perspective, we can see just how dire the state of the world is in. Our false love is sending people into the fire. And, just like this verse shows, loving others does not mean accepting sin. But, we can’t expect people without the Spirit living inside them to live the lives we, as Christ-followers, have been called into. Keep growing in your relationship with Christ, and constantly run from sin in your own life. Remember to continually seek forgiveness for the sins you are still committing, because of the fallen world we live in. As for others, we can both deny evil and still show mercy to them, just as Christ did for us. And I just cannot accept the idea that standing on a street corner holding signs and yelling at passersby is a means of loving them like Jesus would.If we stepped up to our role as the hands and feet of the church, our would would radically change. Eat with the “tax-collectors” in your community. Learn about their past. Share yours with them. Show them grace and selfless love, and save them from the fire by sharing the Gospel with them.